Chapz Barber’s special offers and promotions. Get a great deal on your next visit to Chapz Barbers. Check here for offers and promotions that save you money. Please see below the current promotion by Chapz. We are constantly updating our offers to help save you money on your family’s hairstyling and grooming, so be sure to check here for the latest deals. We have active promotions, a free “First Haircut” certificate for your children and a loyalty card system in place. Totex Strong Matt - This is similar to American Crewe Fibre and Osmo Clay for a strong, great hold and matt, long lasting finish on long or short hair. Totex Matt - This is similar to American Crewe Fibre and Osmo Clay for strong, great hold and matt, long lasting finish on long or short hair. Totex Strong - Promade similar to American Crewe Promade for a long lasting, strong hold. 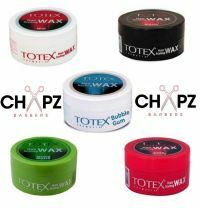 Totex Bubblegum Wax - Similar to Osmo Aqua Hard, for a long lasting hold without weighting the hair down. Washes out with ease. Totex Gum Gel - This is a special hybrid gel wax unlike anything on the market and once customers try it they love it. With every 8th visit to Chapz Barbers at your barber shop of choice. Just pick up a loyalty card on your next visit and have it stamped once you’ve had your haircut. When the card is full you will then be entitled to a free haircut, it's as simple as that! This is so that you can cherish the moment and remember it forever with a lock of their hair attached. Visit Chapz Barbers and bring your son or daughter along for their first haircut certificate. This offer includes a kid’s first haircut parchment style certificate for boys and girls. The barber/hairdresser will also give you a presented hair cutting as a keepsake of your son/daughter's first haircut. A lovely momento for little chapz and little ladies. It is also a great gift idea for families. This offer is great value from €8 and something you will have forever!